Extreme Survival túlélőkés10,5" teljes hossz5,5/8" szén-acél penge Extreme Survival - 10 1/2" overall. 5 5/8" high carbon steel blade with dark gray finish. Textured high carbon steel handle with dark gray finish. Stored inside handle is a bit driver with six assorted screwdriver bits. Black nylon belt sheath with leg tie. Extreme Survival túlélőkés11 7/8" teljes hossz6 3/8" 400 Rm. pengeBarna Micarta markolatExtreme Survival - 11 7/8" overall. 6 3/8" 400 stainless black coated blade. Full tang. Black and brown micarta handles. Lanyard. Black nylon belt sheath with leg straps and protective insert. 12 7/8" overall. 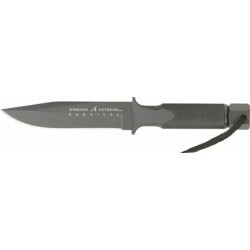 7 3/4" partially serrated black coated SAE-1070 high carbon steel blade. Brown TPR rubberized handles with bayonet clip and lashing hole. Brown Kydex belt sheath. 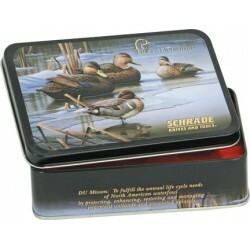 Extreme Survival kés12,1/4" teljes hossz.6,5" Rm. 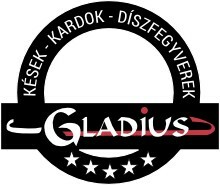 pengeTexturált gumirozott markolatgyöngyvászon tokExtreme Survival Fixed Blade - 12 1/4" overall. 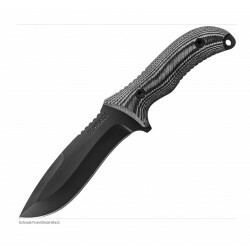 6 1/2" dark gray finish 1095 high carbon steel blade. Full tang. Textured black rubberized handle. Lanyard hole. Heavy black nylon belt sheath with utility pocket and leg tie. 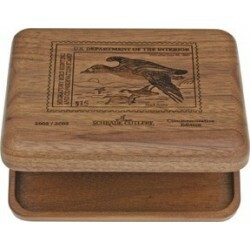 Griffin design. 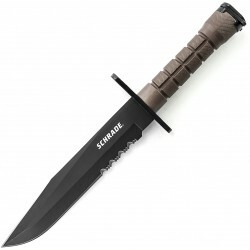 Schrade Brown Tactical Fountain and Roller Ball Pen. Brown housing. 5 7/8" overall. Aircraft aluminum body. 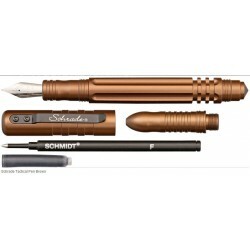 New Tactical Pen with interchangeable fountain or rollerball writing instruments. Overall: 10.5"; Blade: 5.5" l Stainless l Standard Edge l Black Finish; Handle: Black l Micarta; Other Info: Thumb Ridge l Lanyard Hole l Full Tang. Black nylon belt sheath. Boxed. Tactical Drop Point - 8" overall. 3 1/2" 8Cr13MoV high carbon stainless drop point blade with black stonewash finish. Full tang. Contoured black G-10 handles. Lanyard slot. Black Thermoplastic sheath with multiple carry options. 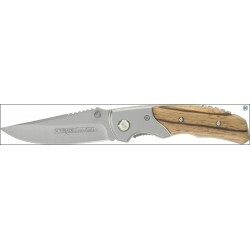 Extreme Survival Drop Point - 10 1/2" overall. 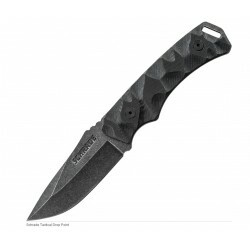 5 5/8" black finish 8Cr13MoV stainless drop point blade with thumb ridge. Full tang. Ergonomic black TPE rubberized handles with textured ring design. Finger guard. Lanyard hole. Black nylon belt sheath with storage utility pouch, protective insert and black nylon cord leg ties. Includes one SCH002 linerlock. 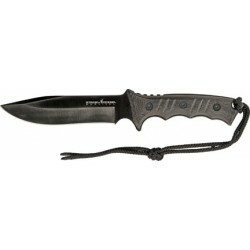 4 3/4" closed with black finish 9Cr14MoV stainless blade with dual thumb studs and stainless pocket clip. 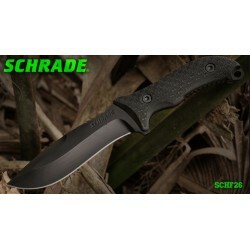 Also includes one SCHF29 fixed blade. 9 3/4" overall. 5" black finish 8Cr13MoV stainless blade. 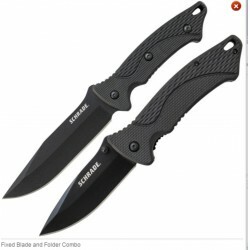 Both knives have black TPE handles with lanyard hole. Black nylon belt sheath holds both. Hang packaged.